*Mechanical seal: Excellent sealing performance, reusable. Protection grade is IP 65. *Function: cable terminal, passive splitter. *Splitter installation position: splitter fixing bracket. 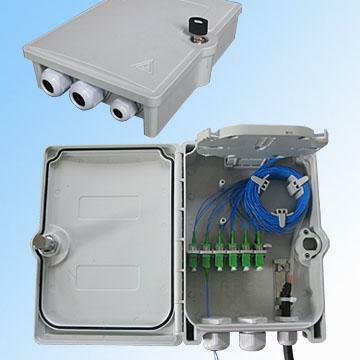 *Series of FTTH products, passive splitter, professional terminal box with many new utility model patents. *Box and key design is easy for operation with complete functions of small size. *Splitter distribution, 8-type or Φ3 cable protective consistency can be achieved less than Φ12 cable termination. *Can be installed 1:8 SC or 1:16 LC mini-type splitter with SC(double core) or LC(four core) adaptor. Maximum for LC is 24 core, for SC is 12 core.